The Isle of Wight (referred to informally as IoW) is a county and the largest and second-most populous island in England. It is in the English Channel, about 4 miles (6 km) off the coast of Hampshire, separated by the Solent. The island has resorts that have been holiday destinations since Victorian times, and is known for its mild climate, coastal scenery, and verdant landscape of fields, downland and chines. The island has been home to the poets Swinburne and Tennyson and to Queen Victoria, who built her much-loved summer residence and final home Osborne House at East Cowes. It has a maritime and industrial tradition including boat-building, sail-making, the manufacture of flying boats, the hovercraft, and Britain's space rockets. The island hosts annual music festivals including the Isle of Wight Festival, which in 1970 was the largest rock music event ever held. It has well-conserved wildlife and some of the richest cliffs and quarries for dinosaur fossils in Europe. The Isle was owned by a Norman family until 1293 and was earlier a kingdom in its own right. The island has played an important part in the defence of the ports of Southampton and Portsmouth, and been near the front-line of conflicts through the ages, including the Spanish Armada and the Battle of Britain. Rural for most of its history, its Victorian fashionability and the growing affordability of holidays led to significant urban development during the late 19th and early 20th centuries. The island was part of Hampshire until 1890, when it became a separate administrative county. It continued to share the Lord Lieutenant until 1974, when it became a ceremonial county. Apart from a shared police force, there is now no administrative link with Hampshire, although a combined local authority with Portsmouth and Southampton is being considered. Until 1995 the island had a governor. During the last Ice Age, sea levels were lower and the Solent was part of a river flowing south east from current day Poole Harbour towards mid-Channel. As sea levels rose, the river valley became flooded, and the chalk ridge line west of the Needles breached to form the island. The first inhabitants are assumed to have been hunter-gatherers migrating by land during the Paleolithic or Old Stone Age period, as the ice began to recede. From the Neolithic era onwards, there are indications that the island had wide trading links, with a port at Bouldnor, evidence of Bronze Age tin trading, and finds of Late Iron Age coins. 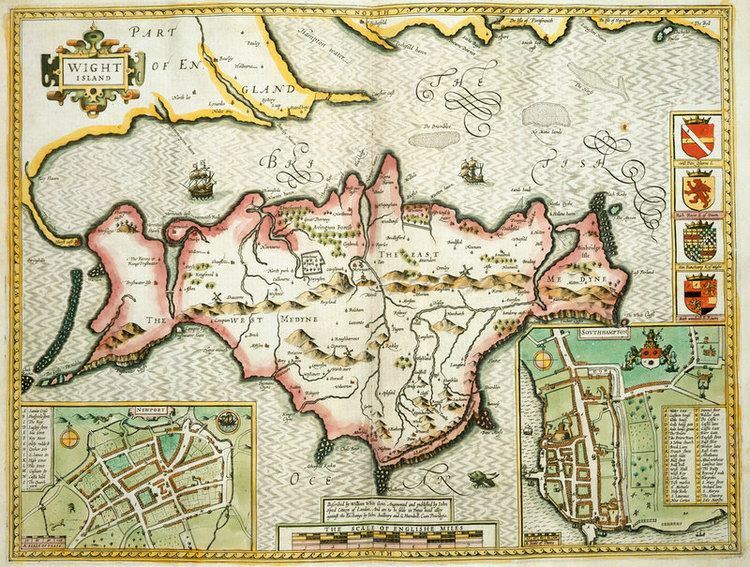 Julius Caesar reported that the Belgae took the Isle of Wight in about 85 BC, and gave its name as Vectis. The Roman historian Suetonius mentions that the island was captured by the commander Vespasian. The Romans built no towns or roads on the island, but the remains of at least seven Roman villas have been found, indicating the prosperity of local agriculture. During the Dark Ages the island was settled by Jutes as the pagan kingdom of Wihtwara under King Arwald. In 685 it was invaded by Caedwalla, who tried to replace the inhabitants with his own followers. In 686 Arwald was defeated and the island became the last part of English lands to be converted to Christianity, added to Wessex and then becoming part of England under King Alfred the Great, included within the shire of Hampshire. During the English Civil War, King Charles fled to the Isle of Wight, believing he would receive sympathy from the governor Robert Hammond; but Hammond imprisoned the king in Carisbrooke Castle. The future Queen Victoria spent childhood holidays on the island and became fond of it. When queen she made Osborne House her winter home, and so the island became a fashionable holiday resort, including for Alfred, Lord Tennyson, Julia Margaret Cameron, and Charles Dickens (who wrote much of David Copperfield there), as well as the French painter Berthe Morisot and members of European royalty. Until then, the island had been rural, with most people employed in farming, fishing or boat-building. The boom in tourism, spurred by growing wealth and leisure time, and by Victoria's example, led to significant urban development of the island's coastal resorts. The world's first radio station was set up by Marconi in 1897, during her reign, at the Needles Battery, at the western tip of the island. In 1898 the first paid wireless telegram (called a "Marconigram") was sent from this station, and the island is now the home of the National Wireless Museum, near Ryde. The island has a single Member of Parliament and 138,300 permanent residents in 2011, being one of the most populated constituencies in the United Kingdom (more than 50% above the English average). However, in 2011 the Parliamentary Voting System and Constituencies Act was to have changed this, as part of the Sixth Periodic Review of Westminster constituencies, but this was deferred to no earlier than October 2018 by the Electoral Registration and Administration Act 2013. Thus the single constituency remained for the 2015 general election. However, two separate East and West constituencies are proposed for the island under the 2018 review now underway. The Isle of Wight is a ceremonial and non-metropolitan county. Since the abolition of its two borough councils and restructuring of the county council as Isle of Wight Council in 1995, it has been a unitary authority. Elections in the constituency have traditionally been a battle between the Conservatives and the Liberal Democrats. The Member of Parliament since 2001, Andrew Turner, is a Conservative, while predecessor Dr Peter Brand was a Liberal Democrat. Since 2009 Turner has been embroiled in controversy over his expenses, health, and relationships with colleagues, with local Conservatives having tried but failed to remove him in the runup to the 2015 election. In the Isle of Wight Council election of 2013 the Conservatives lost the majority which they had held since 2005 to the Island Independents, with Island Independent councillors holding 16 of the 40 seats, and a further five councillors sitting as independents outside the group. The Conservatives retook control, winning 25 seats, in the 2017 local election. There have been small regionalist movements: the Vectis National Party and the Isle of Wight Party; but they have attracted little support in elections. Island residents are sometimes referred to as "Vectensians", "Vectians" or, if born on the island, "caulkheads". One theory is that this last comes from the once prevalent local industry of caulking or sealing wooden boats; the term became attached to islanders either because they were so employed, or as a derisory term for perceived unintelligent labourers from elsewhere. The term "overner" is used for island residents originating from the mainland (an abbreviated form of "overlander", which is an archaic term for "outsider" still found in parts of Australia). The island is said to be the most haunted in the world, sometimes referred to as "Ghost Island". Notable claimed hauntings include God's Providence House in Newport (now a tea room), Appuldurcombe House, and the remains of Knighton Gorges. The island is well known for its cycling, and it was included within Lonely Planet's Best in Travel Guide (2010) top ten cycling locations. The island also hosts events such as the Isle of Wight Randonnée and the Isle of Wight Cycling Festival each year. There are rowing clubs at Newport, Ryde and Shanklin, all members of the Hants and Dorset rowing association. There is a long tradition of rowing around the island dating back to the 1880s. In May 1999 a group of local women made history by becoming the first ladies crew to row around the island, in ten hours and twenty minutes. Rowers from Ryde Rowing Club have rowed around the island several times since 1880. The fours record was set 16 August 1995 at 7 hours 54 minutes. Two rowers from Southampton ARC (Chris Bennett and Roger Slaymaker) set the two-man record in July 2003 at 8 hours 34 minutes, and in 2005 Gus McKechnie of Coalporters Rowing Club became the first adaptive rower to row around, completing a clockwise row. The route around the island is about 60 miles (97 km) and usually rowed anticlockwise. Even in good conditions, it includes a number of significant obstacles such as the Needles and the overfalls at St Catherine's Point. The traditional start and finish were at Ryde Rowing Club; however other starts have been chosen in recent years to give a tidal advantage. Cowes is a centre for sailing, hosting several racing regattas. Cowes Week is the longest-running regular regatta in the world, with over 1,000 yachts and 8,500 competitors taking part in over 50 classes of racing. In 1851 the first America's Cup race was around the island. Other major sailing events hosted in Cowes include the Fastnet race, the Round the Island Race, the Admiral's Cup, and the Commodore's Cup. There are two main trampoline clubs on the island, in Freshwater and Newport, competing at regional, national and international grades. The Isle of Wight Marathon is the United Kingdom's oldest continuously held marathon, having been run every year since 1957. Since 2013 the course has started and finished in Cowes, heading out to the west of the island and passing through Gurnard, Rew Street, Porchfield, Shalfleet, Yarmouth, Afton, Willmingham, Thorley, Wellow, Shalfleet, Porchfield, and Northwood. It is an undulating course with a total climb of 1,043 feet (318 m). The island is home to the Wightlink Warriors speedway team, who compete in the sport's third division, the National League. Following an amalgamation of local hockey clubs in 2011, the Isle of Wight Hockey Club now runs two men's senior and two ladies' senior teams. These compete at a range of levels in the Hampshire open leagues. The now-disbanded Ryde Sports F.C., founded in 1888, was one of the eight founder members of the Hampshire League in 1896. There are several non-league clubs such as Newport (IW) F.C. There is an Isle of Wight Saturday Football League with three divisions, and a rugby union club. The Isle of Wight is the 39th official county in English cricket, and the Isle of Wight Cricket Board organises a league of local clubs. Ventnor Cricket Club competes in the Southern Premier League, and has won the Second Division several times. Newclose County Cricket Ground near Newport opened officially in 2009 but with its first match held on 6 September 2008. The island has produced some notable cricketers, such as Danny Briggs, who plays county cricket for Hampshire. The Isle of Wight competes in the biennial Island Games, which it hosted in 1993 and again in 2011. The annual Isle of Wight International Scooter Rally has since 1980 met on the August Bank Holiday. This is now one of the biggest scooter rallies in the world, attracting between four and seven thousand participants. The island is home to the Isle of Wight Festival and, up to 2016, Bestival. In 1970, the festival headlined by Jimi Hendrix attracted an audience of 600,000, some six times the local population at the time. It is the home of the band The Bees, which performs at smaller local concerts. Trixie's Big Red Motorbike as well as three of the founding members of Level 42 (Mark King, Boon Gould and Phil Gould) came from the island. It has also hosted a one-day festival called "Summer Madness", which started in 2009 headlined by Madness; in 2010 Paul Weller headlined. In January 2011 it was reported that the promoter of Summer Madness was insolvent. The table below shows the regional gross value (in millions of pounds) added by the Isle of Wight economy, at current prices, compiled by the Office for National Statistics. According to the 2011 census, the island's population of 138,625 lives in 61,085 households, giving an average household size of 2.27 people. 41% of households own their home outright and a further 29% own with a mortgage, so in total 70% of households are owned (compared to 68% for South East England). Compared to South East England, the island has fewer children (19% aged 0–17 against 22% for the South East) and more elderly (24% aged 65+ against 16%), giving an average age of 44 years for an island resident compared to 40 in South East England. The largest industry is tourism, but the island also has a strong agricultural heritage, including sheep and dairy farming and arable crops. Traditional agricultural commodities are more difficult to market off the island because of transport costs, but local farmers have managed successfully to exploit some specialist markets, with the higher price of such products being able to absorb the transport costs. One of the most successful agricultural sectors is now the growing of crops under cover, particularly salad crops including tomatoes and cucumbers. The island has a warmer climate and longer growing season than much of the United Kingdom. Garlic has been successfully grown in Newchurch for many years, and is even exported to France. This has led to the establishment of an annual Garlic Festival at Newchurch, which is one of the largest events of the local calendar. A favourable climate supports two vineyards, including one of the oldest in the British Isles at Adgestone. Lavender is grown for its oil. The largest agricultural sector has been dairying, but due to low milk prices and strict legislation for UK milk producers, the dairy industry has been in decline: there were nearly 150 producers in the mid-1980s, but now just 24. Maritime industries, especially the making of sailcloth and boat building, has long been associated with the island, although this has diminished somewhat in recent years. GKN operates what began as the British Hovercraft Corporation, a subsidiary of (and known latterly as) Westland Aircraft, although they have reduced the extent of plant and workforce and sold the main site. Previously it had been the independent company Saunders-Roe, one of the island's most notable historic firms that produced many flying boats and the world's first hovercraft. Another manufacturing activity is in composite materials, used by boat-builders and the wind turbine manufacturer Vestas, which has a wind turbine blade factory and testing facilities in West Medina Mills and East Cowes. Bembridge Airfield is the home of Britten-Norman, manufacturers of the Islander and Trislander aircraft. This is shortly to become the site of the European assembly line for Cirrus light aircraft. The Norman Aeroplane Company is a smaller aircraft manufacturing company operating in Sandown. There have been three other firms that built planes on the island. In 2005, Northern Petroleum began exploratory drilling for oil at its Sandhills-2 borehole at Porchfield, but ceased operations in October that year after failing to find significant reserves. There are three breweries on the island. Goddards Brewery in Ryde opened in 1993. David Yates, who was head brewer of the Island Brewery, started brewing as Yates Brewery at the Inn at St Lawrence in 2000. Ventnor Brewery, which closed in 2009, was the last incarnation of Burt's Brewery, brewing since the 1840s in Ventnor. Until the 1960s most pubs were owned by Mews Brewery, situated in Newport near the old railway station, but it closed and the pubs were taken over by Strong's, and then by Whitbread. By some accounts Mews beer was apt to be rather cloudy and dark. In the 19th century they pioneered the use of screw top cans for export to British India. Its heritage is a major asset that has for many years supported the island's tourist economy. Holidays focused on natural heritage, including wildlife and geology, are becoming an alternative to the traditional British seaside holiday, which went into decline in the second half of the 20th century due to the increased affordability of foreign holidays. The island is still an important destination for coach tours from other parts of the United Kingdom. Tourism is still the largest industry, and most island towns and villages offer hotels, hostels and camping sites. In 1999, it hosted 2.7 million visitors, with 1.5 million staying overnight, and 1.2 million visits day visits; only 150,000 of these were from abroad. Between 1993 and 2000, visits increased at an average rate of 3% per year. At the turn of the 19th century the island had ten pleasure piers including two at Ryde and a "chain pier" at Seaview. The Victoria Pier in Cowes succeeded the earlier Royal Pier but was itself removed in 1960. The piers at Ryde, Seaview, Sandown, Shanklin and Ventnor originally served a coastal steamer service that operated from Southsea on the mainland. The piers at Seaview, Shanklin, Ventnor and Alum Bay were all destroyed by various storms during the 20th century; only the railway pier at Ryde and the piers at Sandown, Totland Bay (currently closed to the public) and Yarmouth survive. Blackgang Chine is the oldest theme park in Britain, opened in 1843. The skeleton of a dead whale that its founder Alexander Dabell found in 1844 is still on display. As well as its more traditional attractions, the island is often host to walking or cycling holidays through the attractive scenery. An annual walking festival has attracted considerable interest. 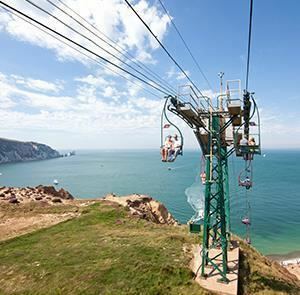 The 70 miles (113 km) Isle of Wight Coastal Path follows the coastline as far as possible, deviating onto roads where the route along the coast is impassable. A major contributor to the local economy is sailing and marine-related tourism. Summer Camp at Camp Beaumont is an attraction at the old Bembridge School site. The Isle of Wight has 489 miles (787 km) of roadway. It does not have a motorway, although there is a short stretch of dual carriageway towards the north of Newport near the hospital and prison. A comprehensive bus network operated by Southern Vectis links most settlements, with Newport as its central hub. Journeys away from the island involve a ferry journey. Car ferry and passenger catamaran services are run by Wightlink and Red Funnel, and a hovercraft passenger service (the only such remaining in the world) by Hovertravel. The island formerly had its own railway network of over 55 miles (89 km), but only one line remains in regular use. The Island Line is part of the United Kingdom's National Rail network, running a little under 9 miles (14 km) from Shanklin to Ryde Pier Head, where there is a connecting ferry service to Portsmouth Harbour station on the mainland network. The line was opened by the Isle of Wight Railway in 1864, and from 1996 to 2007 was run by the smallest train operating company on the network, Island Line Trains. It is notable for utilising old ex-London Underground rolling stock, due to the small size of its tunnels and unmodernised signalling. Branching off the Island Line at Smallbrook Junction is the heritage Isle of Wight Steam Railway, which runs for 5 1⁄2 miles (8.9 km) to the outskirts of Wootton on the former line to Newport. There are two airfields for general aviation, Isle of Wight Airport at Sandown and Bembridge Airport. The Round the Island Cycle Route of 62 miles (100 km). The main local newspaper is the Isle of Wight County Press, published most Fridays. The island has one local commercial radio station: Isle of Wight Radio has broadcast in the medium-wave band since 1990 and on 107.0 MHz (with three smaller transmitters on 102.0 MHz) FM since 1998, as well as streaming on the Internet. The island is also covered by a number of local stations on the mainland, including the BBC station BBC Radio Solent broadcast from Southampton. The island's not-for-profit community radio station Angel Radio opened in 2007. Angel Radio began broadcasting on 91.5 MHz from studios in Cowes and a transmitter near Newport. Local online radio station Vectis Radio has broadcast since 2010, broadcasting from the Riverside Centre in Newport. Online news sources for the Isle of Wight include On the Wight and The Isle of Wight Chronicle. The Chronicle was originally an island local paper during the later 19th and early 20th century. The island has an online 24/7 breaking news source Island Echo, which was founded in May 2012. The island has had community television stations in the past, first TV12 and then Solent TV from 2002 until its closure on 24 May 2007. iWight.tv is a local internet video news channel. The Isle of Wight is part of the BBC South region and the ITV Meridian region. Important broadcasting infrastructure includes Chillerton Down transmitting station with a mast that is the tallest structure on the island, and Rowridge transmitting station, which broadcasts the main television signal both locally and for most of Hampshire and parts of Dorset and West Sussex. Its separation from the mainland yet being near the densely populated south of England led to it hosting three prisons: Albany, Camp Hill and Parkhurst, all located outside Newport near the main road to Cowes. Albany and Parkhurst were among the few Category A prisons in the UK until they were downgraded in the 1990s. The downgrading of Parkhurst was precipitated by a major escape: three prisoners (two murderers and a blackmailer) escaped from the prison on 3 January 1995 for four days, before being recaptured. Parkhurst enjoyed notoriety as one of the toughest jails in the United Kingdom, and housed many notable inmates including the Yorkshire Ripper Peter Sutcliffe, New Zealand drug lord Terry Clark and the Kray twins. Camp Hill is located adjacent but to the west of Albany and Parkhurst, on the very edge of Parkhurst Forest, having been converted first to a borstal and later to a Category C prison. It was built on the site of an army camp (both Albany and Parkhurst were barracks); there is a small estate of tree-lined roads with the former officers' quarters (now privately owned) to the south and east. Camp Hill closed as a prison in March 2013. The management of all three prisons was merged into a single administration, under HMP Isle of Wight in April 2009. There are sixty-nine Local Education Authority-maintained schools on the Isle of Wight, and two independent schools. As a rural community, many of these are small and with fewer pupils than in urban areas. The Isle of Wight College is located on the outskirts of Newport. From September 2010, there was a transition period from the three-tier system of primary, middle and high schools to the two-tier system that is usual in England. Some schools have now closed, such as Chale C.E. Primary. Others have become "federated", such as Brading C.E. Primary and St Helen's Primary. Christ the King College started as a "middle school" but has now been converted into a secondary school and sixth form. Since September 2011 five new secondary schools, with an age range of 11 to 18 years, replaced the island's high schools (as a part of the previous three-tier system). Gardiners Island, New York, United States shown as "Isle of Wight" on some of the older maps.